An intimate venue has re-opened its doors following a major refurbishment – just in time for a resort’s famous arts festival. The Aldeburgh Pumphouse has undergone a raft of improvements to its facilities. The Park Road venue, which has been closed since November, now has toilets, a dressing room and a foyer. Members from music group El Ultimo Tango, who are returning to the Pumphouse for a performance on Saturday, June 25, were on hand yesterday to celebrate the re-opening. 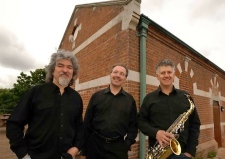 Members of El Ultimo Tango, Eduardo Vassallo (L to R) Mark O’Brien and Mark Goodchild at the Old Pump House in Aldeburgh. Photo copyright EADT. The venue has opened its doors just in time for the Aldeburgh Festival, which also started yesterday. A number of performances are planned at the venue throughout the event. The revamp is part of a £16m capital spending programme by Aldeburgh Music, which runs the festival from its headquarters at Snape Maltings. The Pumphouse, a former sewage company building, originally opened as a festival venue in 2000. It was bought by a neighbouring householder in 1993 and after they carried out some refurbishment work it was donated to Aldeburgh Music. The Aldeburgh Festival, founded by Benjamin Britten, is now in its 64th year and runs until Sunday, June 26. For programme details visit www.aldeburgh.co.uk. An intimate venue on the edge of Aldeburgh Marshes has reopened for the town’s annual music festival. The 60-seat Pumphouse now has toilets, a dressing room and a foyer. The revamp is part of a £16m capital spending programme by Aldeburgh Music, which runs the Aldeburgh Festival from its Snape Maltings headquarters. “It’s very hot, sweaty and exciting and occasionally people from the audience are invited to join in,” said Cal Fell, Pumphouse manager for the festival. The Aldeburgh Festival, founded by Benjamin Britten, returns for a 64th year from 10-26 June with a mainly classical programme. The Pumphouse originally opened as a festival venue in 2000. 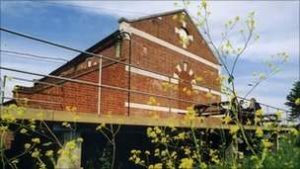 The Pumphouse is a former sewage company building which was bought by a neighbouring householder, Simon Steer, in 1993. He carried out some refurbishment work and then donated it to Aldeburgh Music. Mr Steer said he was confident that the flood plain poses little danger to the Pumphouse.